Today at BlackBerry World, RIM arranged a meeting between Thorsten Heins and all of the members of the press who are attending the show. This meeting marked a significant shift in the company's communication strategy. Under the previous co-CEO structure, the media really never had much of a chance to engage with the top leadership of RIM. Sure, the larger outlets were granted the occasional interview. But there were never CEO addresses to an entire panel of media. Thorsten hit the ball out of the park today. He said all the right things, and he made people in the room like him and RIM. The importance of this can't be understated. With all of the media bashing that has been happening, even people who don't use smartphones have started to adopt the belief that RIM is dying. The only way to stop this is to have the media actually like your company and want to write nicer stuff. Thorsten took the stage today and acknowledged the challenges facing RIM, creating a good agreement frame to warm up the audience. But the structure of what came next was brilliantly crafted. He simply had a conversation with everyone and opened up his thought process regarding the changes that he needed to make inside of RIM. He came off as being sincere, focused, and direct. He talked about RIM having too much fat on its hips through all of the management layers. He told us how RIM grew up as a company managed by consensus. You can't scale that style of management into a $20 billion company, and it was killing RIM's ability to get stuff done. Once he built up respect from the audience he meticulously knocked down so much of the inaccurate reporting that has been going on. He also did this without insulting anyone. Two big topics he set the record straight on were: 1) RIM isn't abandoning physical keyboards. 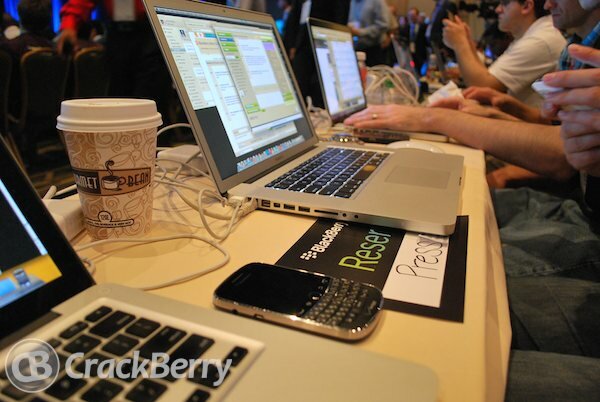 There will be physical keyboards on future BlackBerry 10 devices. 2) Thorsten never said RIM was going to get out of the consumer market. He said they'd partner with other companies. Gaming partners was a good example, since he acknowledged RIM isn't a gaming company. But their engine definitely supports gaming. Over the last decade I've had plenty of exposure to the top executives at RIM. I've had many meetings with Mike and Jim when I worked as a financial analyst. But all of my friends in the media never had the same experience. At least not the new media companies including CrackBerry. Now that RIM needs more positive media attention, RIM's CEO is bringing his A-game. I ran into Thorsten in the hallway early this afternoon. I told him what I thought of his performance. Partly, I just wanted to shake his hand and show some support. But I also wanted to communicate with him just how important I felt it was for him to keep doing stuff like this. I chat with a lot of journalists and many of them have been highly critical of RIM. Without exception, every single journalist that i spoke to left the meeting saying really nice things about his presentation. He is a completely genuine individual. Let me wrap up by saying that RIM needs two things to recover in the market. They need great products, and BlackBerry 10 is the engine to deliver this requirement. But they also need good press. They need to stop being kicked in the teeth while they're down. They need to heal so they can get back up again and fight. Thorsten convinced me, beyond the shadow of a doubt, that he's the right guy to accomplish this at RIM.